What is the single most important factor that differentiates a good or even an excellent enterprise from an outstanding one when it comes to energy management excellence? I believe it is the way an enterprise treats energy data – from the point it is generated to the way it is collected, stored, analyzed, and finally to the way actions are initiated to make the enterprise more efficient. Clearly, the facility/plant engineering team, the O&M and due dilligence practices, use of appropriate technologies are critical factors but I would like to focus on the Energy Management Framework that can get any enterprise started on this win-win environment friendly and bottom line enhnacing journey. I am choosing to focus on this because in my professional experience, I have found that medium sized enterprises especially struggle to start on the energy management journey because in the absence of a playbook, they find it too daunting. ISO 50001 is a voluntary international standard developed by the International Organization for Standardization (ISO) to provide an internationally recognized framework to establish, implement, maintain and improve an energy management system . 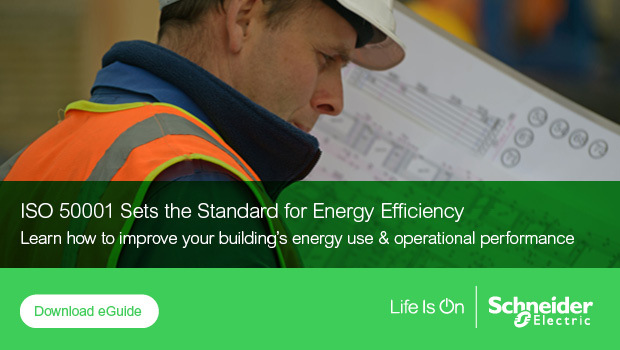 ISO 50001 helps an organization develop and follow a systematic approach for achieving continual improvement of energy performance by setting energy reduction targets. It can be applied to industrial plants; commercial, institutional, or government facilities; as well as entire organizations. Organisations can subsequently use IPMVP, a widely-used global M&V protocol to quantify and calculate energy savings accruing from the implementation of energy conservation measures. A competent internal team or service provider can help an organization in ISO 50001 adoption and compliance by offering services and solutions that meet the various requirements under the standard, such as Energy Review, Energy Baseline identification, establishing Energy Performance Indicators, Objectives, Targets and Action Plans. This internal team can assist in developing the organizations internal / external communication – and effectively provide a complete framework for Monitoring, Measurement and Analysis of an Energy Management System within an organization. 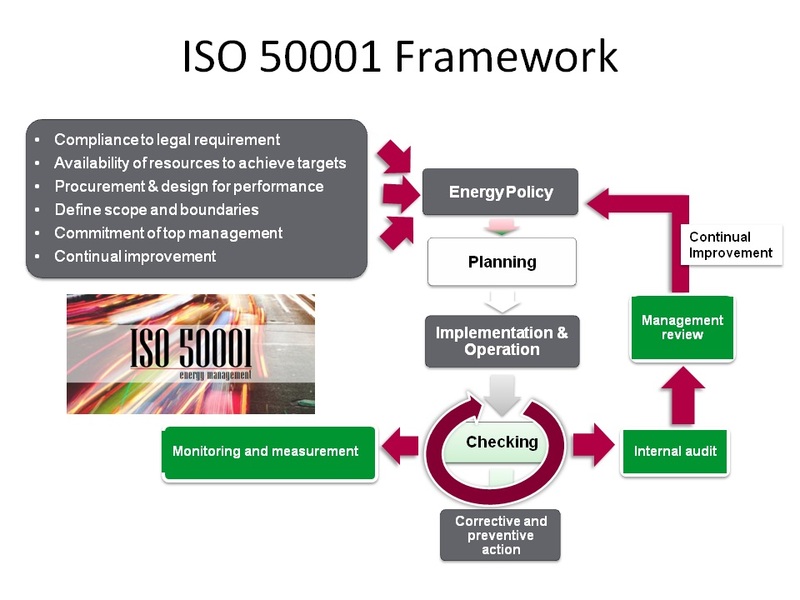 ISO 50001 is an overarching framework for managing energy performance. During the ISO 50001 implementation process, one needs to actively challenge the organization – whether it is an internal customer or an external customer – forcing them to think of relevant Key Performance Indicators (KPIs). For data centers, these KPIs can be PUE, cooling efficiency, IT server efficiency, power distribution efficiency or UPS utilization and efficiency. For buildings, these can be Energy Use Intensity (EUI), kW/ton, lighting power density, fan and pump efficiency, UPS or transformer losses, etc. ; and for manufacturing facilities, these can be energy use or cost per unit of production or per unit of revenue, combustion efficiency of furnaces, energy consumed in the painting and drying process, % of waste heat recovery, and so on. Identifying the right KPIs is probably the toughest but critical part of the exercise because once this is done, then everything that follows becomes relatively easy. Most of the times, the set of KPIs are either already known to the facility managers or can be developed quickly by asking the right questions to get them to start thinking in the right way. 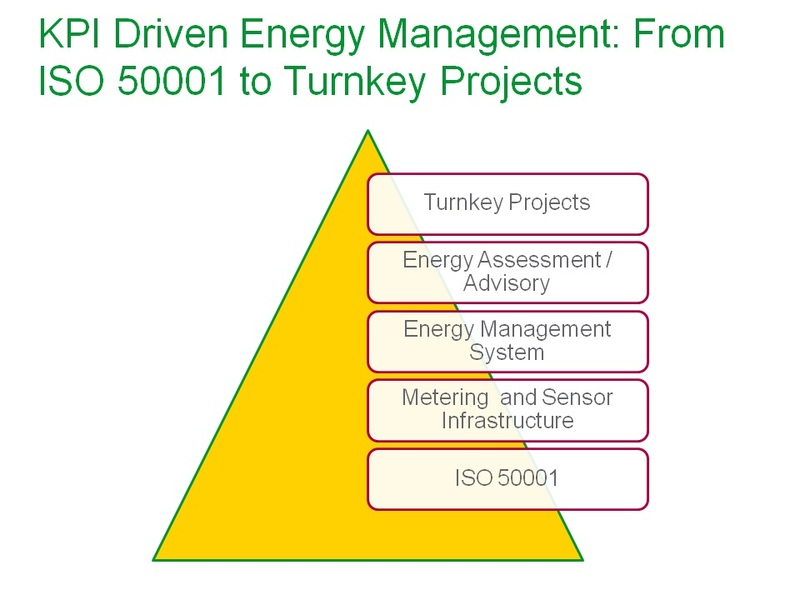 In the next part, I am going to talk about the actions and next steps that need to be taken once an Energy Management Strategy utilizing ISO 50001 has been established. I am selvakumar working as professor in Electrical Engineering department. I would like to have some industry connect to our students which would help their future better. Is it possible to help our students .I had gone through the blogs of your Schneider Electric ,it is very interesting . Our Institution would like to join hands with such an Top Class Industry.Thank you very much.